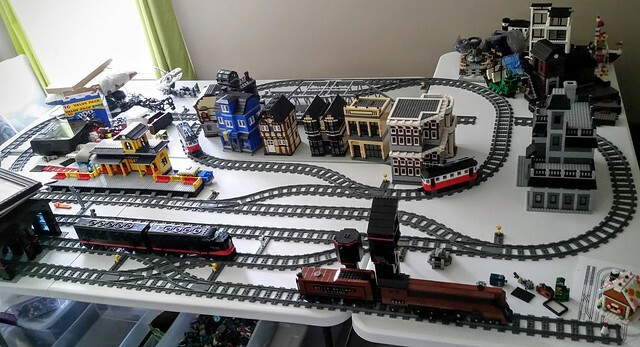 Here is my 2016 layout, with most of the items already built, but some still remain to be purchased. Here is a complete list of what's on my tables, not including trains or automobiles because they can be rotated on or off the layout very easily. All of this sits on three very carefully arranged 30 inch by 72 inch tables. Now for the reality check: This is the current state of my trains and town layout. I don't have any other space for things on the table, as below the tables and in the closet is full of Lego bins, either color sorted in slide-out drawers, former model chunks in bins, or put together in customized paper boxes. Here we see the entire layout and compared to the nice chart I posted earlier, it's bit of a mess. 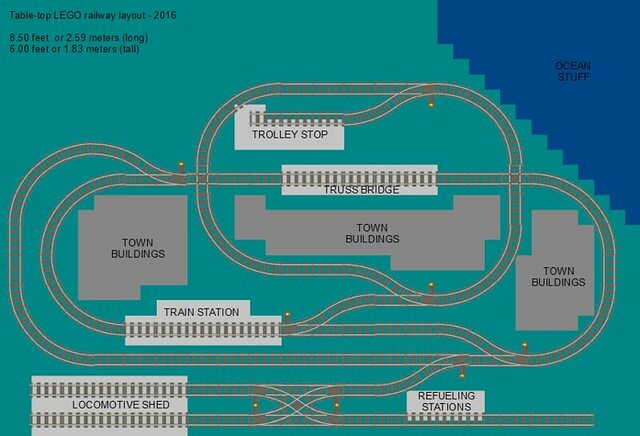 The water models area has a police station and Cloud Cuckoo Land in it, and the left hand town area next to the station has my clock radio and assorted stuff for models not yet built. The town is mostly there, with the streetcars rounding the curves onto and off the main street. The sections only needs two 90 degree (X) crossings to be finished. Now you may be thinking it's really bad, but it is a lot better than it was, and still has a ways to go. It's all about baby steps toward the larger goal of having my dream layout, something I have always wanted since seeing my Dad's layout when I was 5 or 6. 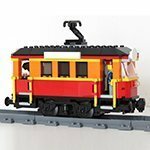 For those wondering, here's my ideal layout's items.... most of them I have already, but a half-dozen or so I don't own yet. Comments and feedback would be really appreciated! This looks really nice, although I'd like to more of that tramp steamer! 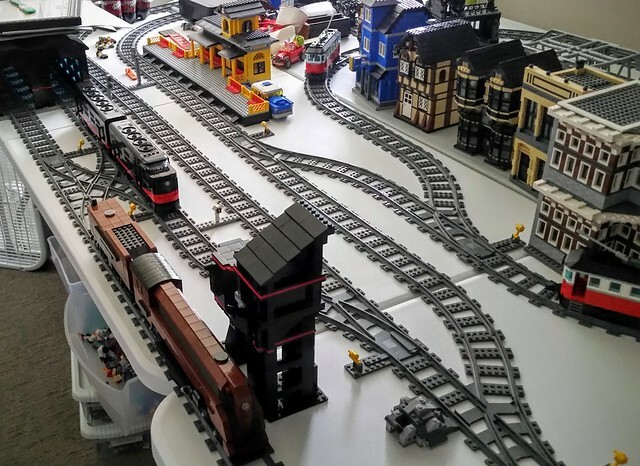 A very beautiful layout, indeed. But why not to add baseplates to it? I think it will become ever better. Murdoch17. I saw your post over on the ME Models thread about needing some cross-overs. Here is a nice custom one that is pretty cheap on eBay. Perhaps it will suit your needs. I don't do base-plates that much, they are too flimsy and expensive in the colors I would need. Thanks anyway!